Description: This is one of the most sought-after Little People sets from the late 70's, eventhough it doesn't have a base. It is the second set of Sesame Street extras, lasting a single year after not proving as popular as the first Sesame Street extras set (#939). 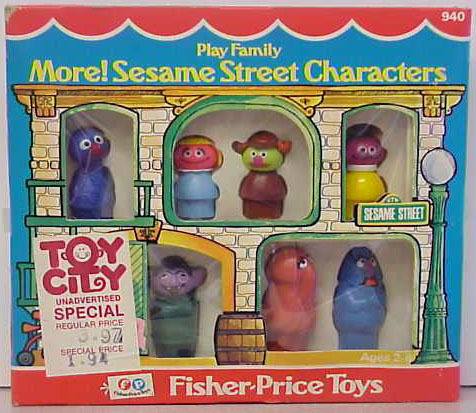 This set introduced 4 exclusive--and now high-demand--people that were not sold with the #938 Sesame Street nor #937 Sesame Street Clubhouse: Sherlock Hemlock, Prarie Dawn, Snuffle-upagus and Herry Monster. Slightly less in demand are the other three figures: Grover, Roosevelt Franklin and the count, all of whom appeared simultaneously in the Clubhouse set. A boxed #940 is extremely rare to find, and very expensive. Other Information: This set was sold in a 9-3/8" long x 8-1/4" wide x 1-1/2" deep display box, which was designed and decorated by the then Fisher-Price designer John Smith. The box looks like a scene of Sesame Street and has 5 display windows.